When – Friday, Oct 11th 2013 and Saturday, Oct 12th 2013 at 6:30 p.m. 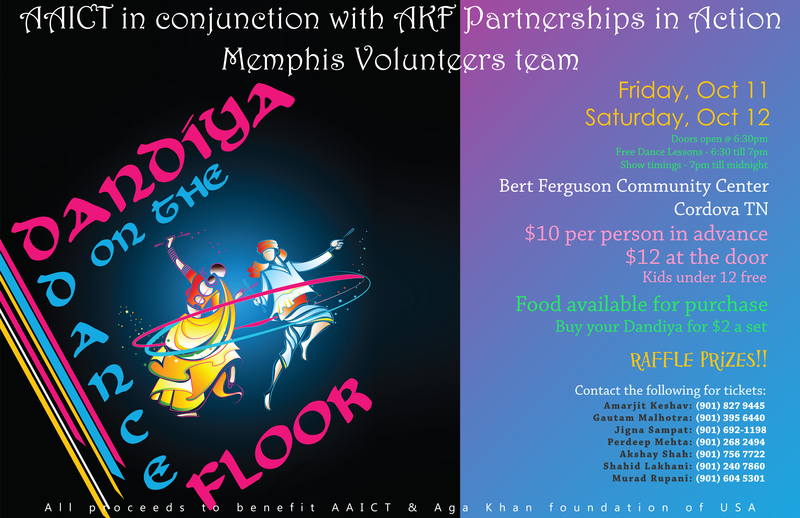 This is a great opportunity to dress in colorful traditional Indian outfits, catch up with friends, eat some Indian food and have some dancing fun! To those new to this, Dandiya Raas is an Indian folk dance to rhythmic beats and clattering sticks. The bamboo sticks used for this dance are called Dandiya. This dance usually follows Garba Raas, a dance that involves use of rhythmic clapping and foot movements. Both the dances are performed during the festival of Navratri and is kind of a social participation dance as they have very simple steps that one can learn on the spot. Following the lead of an experienced dancer, anyone can join the group. It is a performance that asks nothing in return. So if you get an opportunity and if you have time, pick up the sticks and sport a smile on your face! You may enjoy the experience and realize that there’s more to dandiya than this blog tells you. Come join us to show case the culture in a fun-filled way that will leave you entertained. 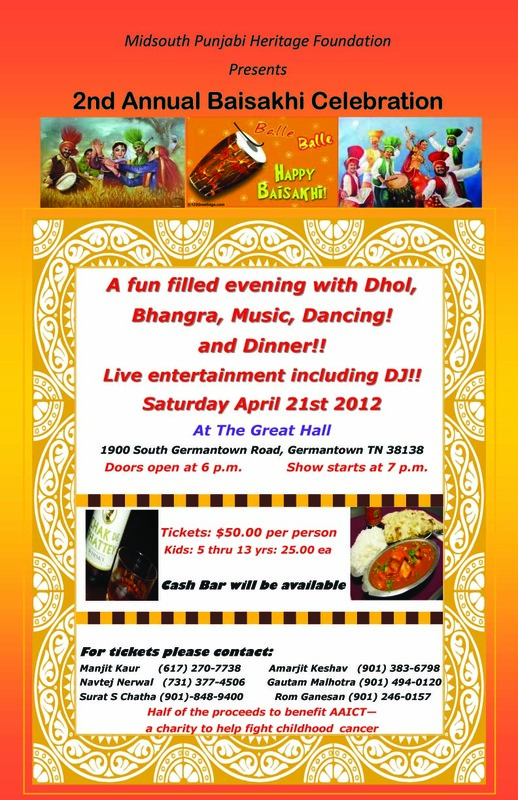 We invite you to experience the spirit of India at the Annual Baisakhi Celebration on April 21, 2012 at 6:00p.m. at The Great Hall, 1900 South Germantown Road, Germantown, TN 38103. Make merry and celebrate the day with jubilant music, soulful dances, and lots of delicious Indian food. Cancer is a battle that many of the young children must face every day. Survival rates among children with cancer may have significantly improved over the past few decades. But the fight against cancer is still painful and depressing. Even today in India, there is still a stigma attached to cancer, especially in the low-income families. Fear about cancer being “contagious” or that the child is to blame is so common that it leads to isolation of that family at a time when they are most in need of help. Your child being diagnosed with cancer is probably the most devastating situation a parent will ever face. The unimaginable thought of losing your child to cancer can cause sadness, anxiety, anger, or even hopelessness in parents. This coupled with expensive nature of the treatment makes it impossible for the poor families to even hope for a cure. They have to literally beg for treatment as they struggle under the double burden of their disease and poverty. The treatment can be a huge drain on family finances, even for the relatively well off. Life for children undergoing treatment for cancer revolves around trips to the treatment center. Not only are the side effects from the treatment debilitating, but the emotional stress is equally intense. Staying in a hospital for weeks can be frightening. Children get upset by visits to hospitals, seeing doctors, needles, medicines and all the strange people that they have to deal with. The need to nourish cancer affected children, emotionally through love and care is vital. We know they are suffering from a painful disease but more important is that they remain hopeful in life. Love, prayer and a lot of help from family and friends is needed to survive through the weeks of horror. Providing emotional and practical support makes them hopeful in life. With hope and optimism, they can and will cope with the disease. If you are hesitant to donate, or simply ignorant to the facts; please take a moment to read about our work. AAICT is committed in helping the under privileged children suffering from cancer get free treatment and relieving them from the double burden of their disease and poverty. We build a bridge of hope in their lives. Even if you choose not to donate financially, please take a moment to recommend us to your friends. With your support, we know we will make a difference – that’s our optimism! It was the fourth year in a row that Musipals have come forward for raising funds for AAICT helping children fight cancer. 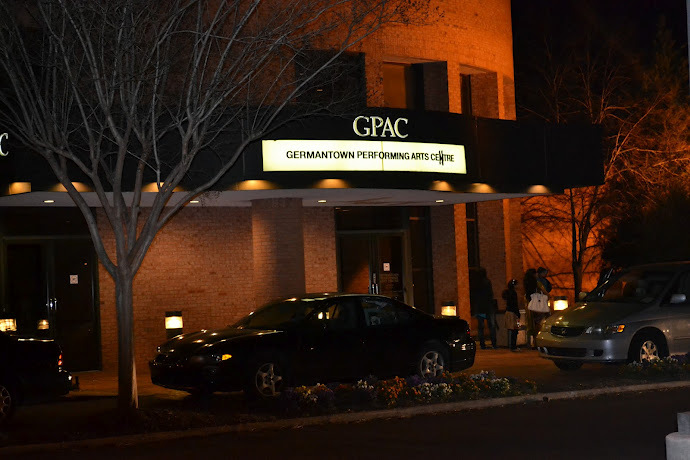 This year’s show was hosted at Germantown Performing Arts Center on March 3rd, 2012. For those who missed out attending the show, here is a quick recap. The evening started with dinner which was earlier than planned as people started pouring in before the scheduled time. Very unusual for an Indian event !! After re-fueling and enjoying some great Indian food, everyone was ready to sit back and enjoy some music. 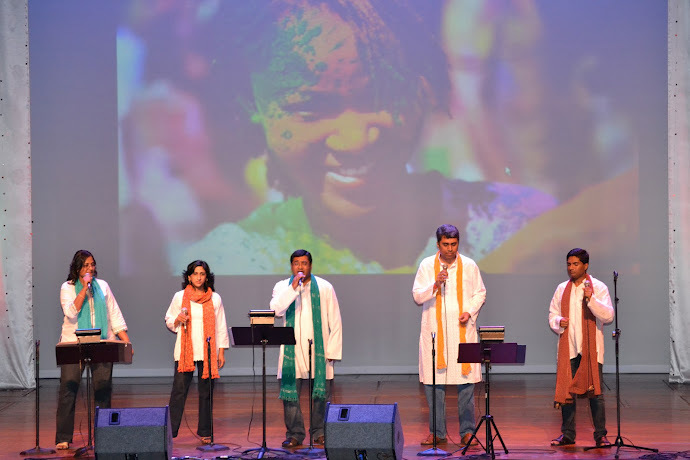 This year’s theme was ‘Colors of Music’ and the evening started of with a colorful and ‘dhamakedar’ Holi group song. The song lineup was pretty amazing….from the old golden hits to the latest viral song. It was one of those moments where I thought I had forgotten most of the olden hits. Well, it was like riding a bike after ages which you thought you had forgotten. Memories came back as they sang “Abhi Na Jao Chodkar” (by Balaji/Vani) and “Kora Kagaz Tha Yeh Mann Mera”(by Anil/Preeti). Foot tapping numbers were well mixed in between melodies. Starting from “Dhinka Chika”(by Vidya/Srinivas) to “Mere Dholna Sun”(by Preeti/Balaji), “Ankhoin ki Gusthakiyan”(by Ram/Vani) to “Dola Re”(by Alice/Preeti) , from “Dil hoom hoom”(by Sangeeta) to “Kolaveri”(by Srinivas) and finally “Sheila ki Jawaani”(by Alice) to end the great evening. MC for the evening, Roshni D’souza, did a great job by moving things along comfortably, entertaining the audience with her charm and light humor to keep it interesting. 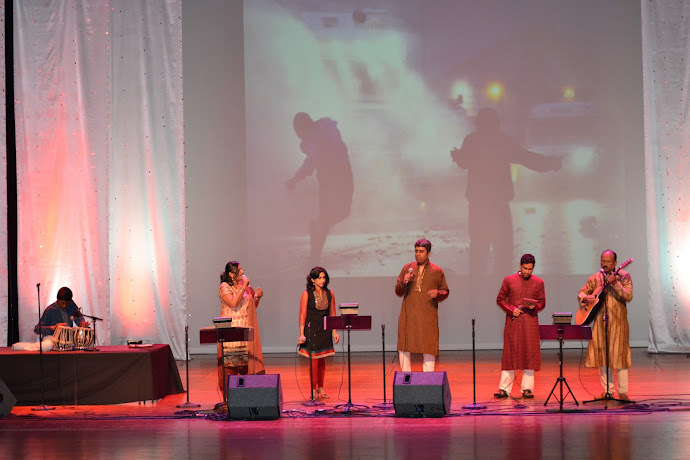 Highlight of the show was the “World Peace Unplugged” segment that included songs like “Krishna Nee Begane Baro” with live instruments which was a dedication to Michael Jackson. Strumming Guitar by John meeting Indian Tabla by Prashant (a high schooler) was a soothing treat to the ears. Every singer performed their best and really got the crowd moving. At the end of the show some even said that “I don’t feel like I am in the United States. People have to come here to really get it.” I agree — you really need to experience the Music Fest for yourself. It was great to see families and friends out enjoying such a beautiful evening. Check out the photos that will be uploaded soon to see what you missed.